Quit the leaky bags of ice and those old hot water bottles. With Amethya's set of cold and hot portable gel packs you can secure pin relieve wherever you need it, with no mess. 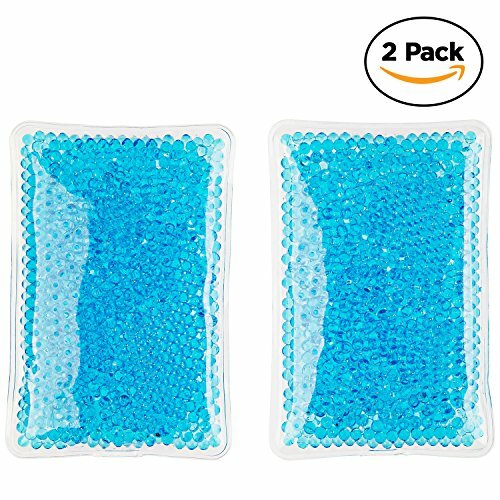 It includes two reusable gel packs, which can be used for either hot or cold therapy. Just microwave them, or put them in the freezer. Made of safe, non-toxic gel. Stays flexible when frozen, and it's kept in a sturdy, leak-proof plastic. The Hot/Cold Pack can reach extreme temperatures. Do not use on bare skin. Wear a t-shirt or similar material to protect your skin. Always use a sleeve or towel when handling the Hot Gel Pack. Apply hot/cold pack to the skin for 20 min periods ONLY. You may repeat every 2 hours. Cease use if pack causes discomfort. If you are affected by circulatory problems, heart problems or diabetes then seek medical advice before application. For external use only. If fluid contacts skin/eyes, flush with water. If gel is ingested drink plenty of water (not milk) and seek medical attention. Do not apply the pack to an open wound. Always use gel pack under adult supervision. Keep out of the reach of small children. If you have any questions about this product by Amethya, contact us by completing and submitting the form below. If you are looking for a specif part number, please include it with your message. Hip Shoulder Gel Ice Pack Pain Relief with Strap, Large Hot Cold Therapy Compression, Great for Relieving Pains, Sprains, Bruises, Sports Injuries on Knee, Back, Thigh, 14" x 11"